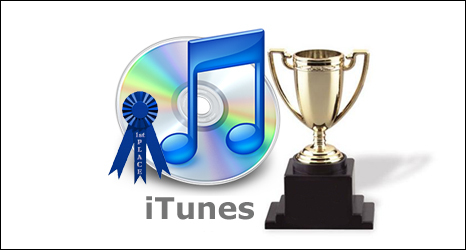 Apple (thanks to iTunes) has officially surpassed Wal-Mart as the #1 music sales retailer in the US. 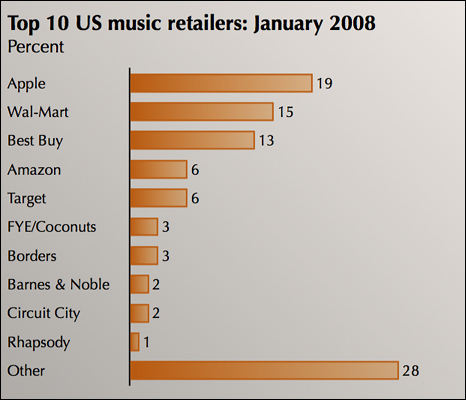 We’ve seen it climb for some time now with Wal-Mart still topping the charts, but in an email sent to Apple employees yesterday afternoon, an excel file showing the top ten music retailers in the US for January 2008 shows Apple in the number one spot. The iTunes Store leads the pack with 19 percent, Wal-Mart (which includes the brick-and-mortar stores as well as its online properties) is second with 15 percent, and Best Buy is third with 13 percent. Amazon is a distant fourth at 6 percent, trailed by the likes of Borders, Circuit City, and Barnes & Noble. 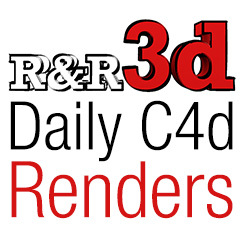 Rhapsody is in the tenth slot with 1 percent. The fact that a digital-only retailer has ascended to the top of the sales charts is not surprising, but it does demonstrate just how much the music industry has changed since the beginning of the 90’s. The NPD Group has been doing some research on digital download sales and have found that 48 percent of US teens didn’t buy a single CD in 2007, compared to 38 percent in 2006. It has been a dizzying climb for Apple, which only managed to pass Amazon to become the number three music retailer in June 2007. The biggest surprise is Amazon’s drop to the number four slot, which might be explained by consumers using iTunes, Wal-Mart, and Best Buy gift cards to buy music after the holiday seasonâ€”and those gift cards certainly helped propel Apple to the number-one position. Granted this news is based on articles distributed among Apple employees and their data could be skewed or incorrect, but there’s no evidence against their #1 seat either.